Magne in front of his version of Sgt. Pepper’s Lonely Hearts Club Band. The black P and B is an homage to Sir Peter Blake. Magne’s new Beatles-inspired exhibition Norwegian Wood opened with a private view at the Paul Stolper gallery in London last night. 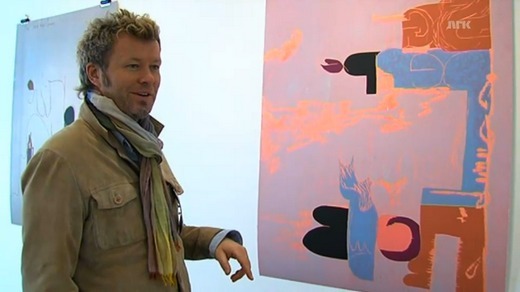 NRK had an interview with Magne yesterday, as he prepared for the opening, which can be viewed here. 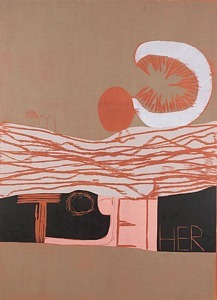 Norwegian Wood came about because Magne wanted to return to his woodcut-techniques of the mid-90s. 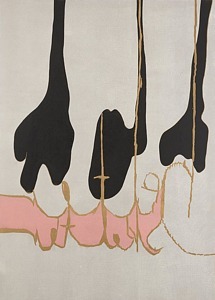 During the preparations, he was asked to make the music for the upcoming Beatles-movie, which in turn inspired the theme of this exhibition. “The Beatles was our pathway to adventure, they were our big heroes. We were like those boys in Lars Saabye Christensen’s book, we grew up with The Beatles. We had big dreams and made it big, largely because of them”, Magne told NRK. For the artistic process, Magne was able to borrow antique woodcut tools from Sir Peter Blake, who designed the album cover of Sgt. Pepper’s Lonely Hearts Club Band. Some photos of Magne creating the woodcut prints at Atelje Larsen in Helsingborg, Sweden can be seen at paulstolper.com. Blake was scheduled to attend the private opening yesterday, where Magne would return the tools. “Paul McCartney couldn’t make it to the opening, unfortunately, but he sent an e-mail with his best wishes”, Magne says. Magne will be busy working on the Beatles film music in the coming fall and winter, but he’s already got some ideas ready. Magne has also made a few other public appearances recently. On April 18th he appeared at The Thief in Oslo, as UK newcomer Gabrielle Aplin did an intimate showcase gig. “The concert was really good. She writes and sings beautifully. People should keep an eye on her, and be proud that they had a chance to see her this early”, he told seher.no. On April 29th Magne attended the European opener of Bruce Springsteen’s Wrecking Ball Tour 2013, at Telenor Arena in Oslo. “I’m the world’s biggest Bruce Springsteen-fan”, he said (sarcastically?) as he walked in the VIP-entrance.